They must be sprinkling pixie dust in the water. Brendan Hyland set junior and senior records in the Men's 200m Butterfly. RECORDS WERE GETTING smashed like plates at a Greek wedding in Lisburn today at the Irish Sort Course National Championships. Athlone’s Brendan Gibbons kicked off proceedings on day two of the championships in by setting a new Irish Junior Record in the Final of the Men’s 1500m Freestyle. Gibbons, who was a member of the European SC Team in France last week, set a new standard of 15:26.03 beating off two Aer Lingus swimmers, Conor Turner (15:29.73) and Andrew Meegan (15:39.63). Brendan Hyland, a NAC High-performance Centre swimmer, set a new junior and senior Record in the 200m Butterfly Final. The 18-year-old from Tallaght, who set five National Records at Europeans, won Gold ahead of Galway’s David O’ Sullivan (2:02.10) and James Brown (2:08.53) of Ards. And the records continued to fall as NAC SC swimmer Brian O’Sullivan broke Karl Burdis’ 2008 Irish Junior Record in the 50m Backstroke. O’Sullivan knocked .05 of a second off the record of 26.02 when he touched in 25.97 securing the Gold medal. Galway swimmer Cian Duffy kept the trend going with a new junior record of 2:03.46 in the 200m Individual Medley Final. Duffy had set the previous record of 2:04.01 at the European SC Championships. Barry Murphy (49.96) won Gold in the 100m Freestyle Final today in his last race before the World SC Championships in Istanbul starting on 12 December. Kilkenny’s David Prendergast (50.42) took Silver in the event with Brian O’Sullivan (51.54) picking up his third medal of the day finishing in third to complete a trio of Gold (50m Back), Silver (200m IM) and Bronze medals – a handy day’s haul. The girls from Bangor finished off the session on a high when they set a new junior club relay record in the 4x50m Freestyle. Jenny Drennan, Jemma Speers, Mary-Kate McDowell and Emma Reid, all members of Swim Irelands National Youth and Junior Squads, clocked 1:50.07 in a new club record time. Competition continues tomorrow with Sycerika McMahon back in action. Email “National championships: Junior swimmers smash Irish records in Lisburn”. 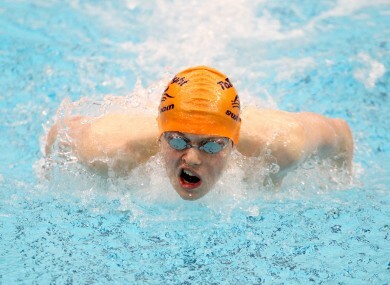 Feedback on “National championships: Junior swimmers smash Irish records in Lisburn”.